Mexico is celebrating its bicentennial. The long struggle for independence began on this day in 1810; independence was finally “awarded” by Spain in 1821. By happy coincidence, 2010 also marks the centenary of the start of the Mexican Revolution. This has a less clear-cut ending date, with some Mexicans saying that it is still on-going today. 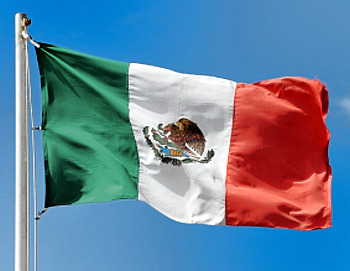 It was during the Mexican Revolution that Mexico’s current constitution of 1917 came into effect. Following independence, the rush was on to draw an accurate map of all of Mexico’s territory. Mexico’s boundaries following independence were very different to today. Flows of migrants linking the USA to Mexico at that time were from the USA to Mexico (see link), the reverse of the direction of more recent flows, which have seen millions of Mexicans migrate north looking for work. Political events conspired to bring Mexico into direct conflict with the USA in the Mexican-American War of 1846-1848. The 1848 Treaty of Guadalupe Hidalgo, signed after the war, ceded over half of Mexico’s territory to the USA. A few years later, under the 1853 Gadsden Purchase (Treaty of La Mesilla), northern portions of Sonora and Chihuahua were transferred to the USA. This established the current border between the two countries. Minor modifications have been negotiated since to take account of changes in the meanders of the Río Bravo (Grande). In 1910, then president Porfirio Díaz decided that the centenary of Mexican independence should be celebrated in style. One of the reasons why the “traditional” Grito (“shout) is made on 15 September each year, rather than on the morning of 16 September (when Father Miguel Hidalgo apparently gathered his parishioners in revolt) is because 15 September 1910 happened to be Díaz’s 80th birthday. Why not have one big bash and celebrate both president and country at the same time? Unfortunately for the then president, the Mexican Revolution broke out later in the year and in 1911 Díaz was exiled to Paris. One of the major events during the centenary of independence celebrations in 1910 was the opening to the public of Teotihuacan, the archaeological site an hour’s drive north of Mexico City. Months of frantic cleaning and restoration were completed just in time for the official opening. This marked the start of mass tourism based on Mexico’s cultural heritage. The haste with which Teotihuacan was readied for tourists led to some unfortunate errors of reconstruction. For instance, the number of levels now seen on the Pyramid of the Sun does not correspond to its original form. Of course, Mexico’s unbridled pursuit of tourism in the past 80 or so years has led to lots of other serious environmental and cultural issues elsewhere. Mexico has come a long way in 200 years, but amazingly, to the best of our knowledge, Geo-Mexico: the geography and dynamics of modern Mexico, published earlier this bicentennial year, is the first ever book in English focused exclusively on the nation’s varied and fascinating geography.